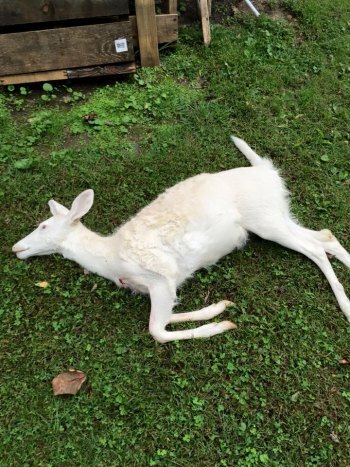 MADISON, W.Va. – The West Virginia Natural Resources Police have solved an albino deer killing case in Boone County, thanks to help from Facebook users. On Sept. 27, 2015, Natural Resources Police Officer Dakoda Chattin got a call from Boone County 911 advising that an albino deer had been shot and killed in someone's yard along Route 17. After interviewing witnesses, the only evidence available was that there were multiple suspects involved and they drove a smaller model gray truck. The incident was posted on the Natural Resources Police Facebook page (www.facebook.com/DNRpolice) with a request for help from the public. That post was seen by nearly half a million people and was shared by more than 7,000. Information received following the post helped Officer Chattin learn of suspects who might have committed the crime. After investigation and research into names provided by the public, Officer Chattin made contact with three suspects. They admitted in their statements that they had committed the unlawful act. Charges include hunting without a license, hunting during closed season, carrying a loaded firearm in a motor vehicle, shooting from a motor vehicle, shooting from a public road, and illegal firearm for deer hunting. "We continue to be impressed with how we've been able to solve crimes with the public's help," Natural Resources Police Col. Jerry Jenkins said. "The response has been beyond what we anticipated when we began using Facebook earlier this year. It's become a valuable tool for us to gather information about crimes and suspects. It shows how deeply the community of hunting and fishing enthusiasts in West Virginia cares about protecting wildlife and enforcing laws. We encourage anyone who sees anyone violating the state’s wildlife laws to call 911 or their closest DNR district office."